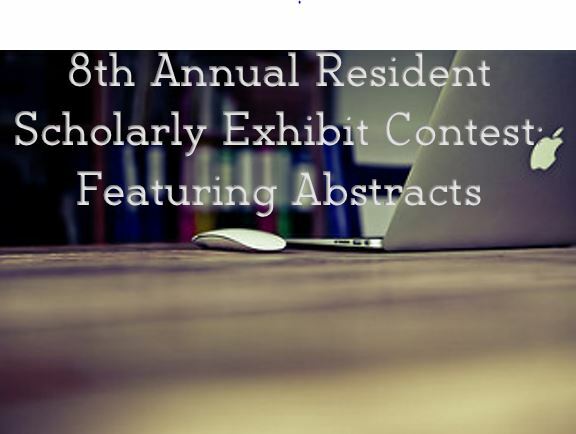 We would like to thank all the residents who submitted an exhibit at this years 64th Annual Scientific Assembly. In recognition of their hard work and dedication, the abstracts to their research are published below. ABSTRACT: A multi-disciplinary quality improvement (QI) team was formed to reduce potentially avoidable emergency department visits for patients at the practice site for the University of Kentucky Family Medicine Residency. The QI team developed an innovative approach to reduce emergency department visits via Plan-Do-Study-Act (PDSA) cycles that focus on increasing connectedness between the primary care practice team and patients who have a high percentage of emergency department visits relative to primary care office visits. The QI team used an electronic health record to identify this cohort of patients and employed several strategies to increase relationship-based care including telephone outreach, written communications, new medical home pamphlets, office visits, and use of cloud-based secure electronic communications. This session will share the results of these efforts and seek feedback from attendees regarding other strategies to reduce potentially avoidable emergency department visits. Title: Will implementing social work consults and physical/occupational therapy consults in admission orders reduce length of stay (LOS)? ABSTRACT: Increased length of stay for hospital admissions is affected by social issues (homeless, pre-authorizations, and etc) and physical/occupational evaluations for nursing home placement. In the era of cutting costs in U.S. hospitals, a reduction in excess length of stay could save money. Data collected from Jewish Hospital Downtown and University of Louisville Hospital (ULH will be used. Only patient cases who were treated under the Family Medicine Residency Program’s Hospital service will be evaluated. Collected: Primary discharge diagnosis DRG based on ICD-9/ICD-10 codes, number of cases filed under that particular DRG, ALOS (average length of stay), ELOS (estimated length of stay i.e. projected length of stay based on Medicare standards). LOS Index (ALOS/ELOS) and readmission rates based on primary DRG within 30 days of discharge were reviewed. Time frame was from May-August 2014 and May-August 2015. The modifier is the addition of social work consults and physical/occupational therapy consults in the 2015 admission orders. Preliminary results show slight increase in length of stay in 2015 at both hospitals. However, readmission rates have decreased at both institutions in 2015. Although the hope was for decrease in length of stay, re-admissions decreased at both hospitals. Which drives the question, is the real benefit in preventing re-admissions, especially with lack of repayment from Medicare? A conclusion is not available at this time of abstract submission. ABSTRACT: The PCMH model has been shown to improve quality of care delivered in primary care practices. The family medicine residency has recently implemented a PCMH model, and one goal is to improve preventative health needs. Smoking cessation is a topic that is challenging in the general population, and PCMH aids to streamline discussion with patients to quit smoking. Our study involved collecting a randomized sample of established patients in the FM residency clinic before and after the PCMH model started, between ages 40-65, with Medicaid insurance who are current smokers that smoked a minimum of ½ PPD. Parameters studied include: % of patients who received counseling, % who have been prescribed pharmacological agents, % who have received educational material, and % of individuals have received vaccinations based on smoking status. Initial results show that with implementing a PCMH model, compared to when the model was not in place, there is a higher incidence of smoking cessation counseling being done in office, a higher rate of patients either cutting down on PPD, or stopping altogether, an increase in the amount of educational material given, and an increase in pneumococcal vaccines administered. Initial results show that implementing a PMCH model has improved the rate of smoking cessation in our general population, and helps streamline a process to make it easier for physicians to counsel patients, with available resources. The poster session will also discuss further steps that will incorporate smoking cessation. ABSTRACT:Transition of Care (TOC) has always been a familiar term in family medicine. Primary care providers have a responsibility to facilitate the transition of patients from the inpatient to the outpatient setting. Transitional care management (TCM) codes recently arrived providing higher reimbursement with additional expectations. A designated primary staff member called and scheduled appointments for patients discharged from hospitals within 2 business days. These “TOC” patients were monitored from October 2014-March 2015 and compared to patients seen during the same months one year prior. It was postulated there would be a decrease in the rate of hospital readmissions, an increase in the percentage of patients that followed up in clinic after discharge, and a resultant increase in reimbursement. We observed a 19.4% 30 day hospital readmission rate. Pre-TOC policy showed a 21.2% rate. While this result was not statistically significant (p-value <.05), there was a 1.8% decrease in readmission. Utilizing cross-tabulation via SPSS 22.0, we calculated that 48.3% of patients were seen within 14 days of discharge. After implementation, 57.4% patients were seen, a 9.1% increase and statistically significant. For Medicare patients, reimbursement is $182.6442 for TCM as compared to $76.8000 for regular visits. During this period, we conducted 151 TOC visits equating to an additional $15,981.84 in reimbursement. Since implementing our new TOC Policy, we have observed a higher rate of clinic follow-up, a lower number of hospital readmissions, and received additional reimbursement. We look forward to establishing additional relationships with outlying hospitals, as well as expanding our patient population. ABSTRACT: A new patient presents to a rural clinic with a curious rash on his feet. A 30 y.o Caucasian male with h/o HTN, obesity, and mildly elevated transaminases presents himself to the clinic for elevated BP and rash. The only medication he takes is Metoprolol Tartrate. The rash consists of rust colored patches with no raised areas, located on the dorsal aspect of his feet bilaterally. Patient denies any itching or pain to the area. Of note, he noticed that the discoloration has progressed over the last 5 years, while he has been working as a truck driver. There are several differentials for skin discoloration/rash, to name a few: Addison’s Disease, Vasculitis, Medications, Hyperthyroidism, Hemochromatosis, Diabetes Type II, Fungal infection, and Petechiae. The lab tests ordered for this patient were ACTH, CBC, TSH, CMP, HgbA1c, and Iron, all of which were normal, except for elevated AST and ALT. The patient was diagnosed with Schamberg’s Disease, a subclass of Progressive Pigmented Purpuric Dermatitis, which is a rare condition first described in 1901. It is diagnosed clinically and consists of reddish-brown patches found commonly in the lower extremities, which are caused from inflammation of capillaries, RBC diapedesis, and hemosiderin deposition. This chronic, benign condition usually starts in the fourth-fifth decade of life, and there is no gender or ethnic predominance. It is asymptomatic and persistent, and treatment is usually ineffective. Support stockings are recommended for patients with Schamberg’s Disease.